OH THE PLACES YOU'LL GO: Is Life Better With A Porch? I'll confess. 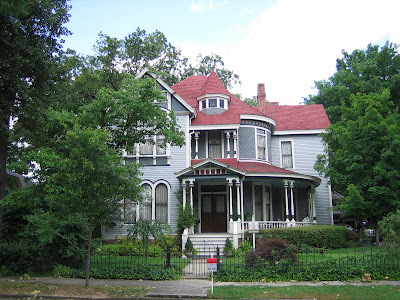 I have a thing for historic homes. I fully acknowledge that it would be a ton of work to renovate/maintain one, but I guess my fantasy is to live in a home with character. A home that looks unlike anyone else's. A home that has a past, a story and a life of its own. 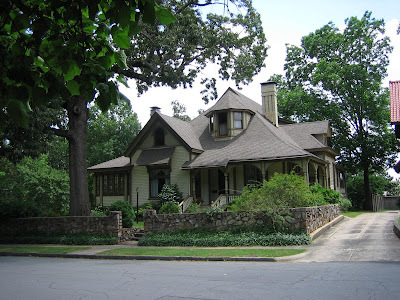 Here are a few from Little Rock's Quapaw Quarter that evoke strong feelings of home lust in me. What do all these homes share? A front porch. 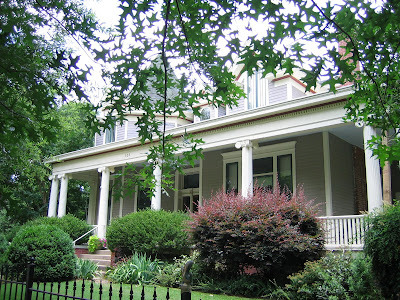 In the South, where I grew up, all grand homes of a bygone era have front porches. Modern homes? If anything, it's more likely to be a deck or screened porch in back. When I see a front porch, I imagine drinking cold lemonade and chatting on the porch swing and saying hello to neighbors and slowing down enough to appreciate life. I know it's a lot to read into a porch, but that's what it symbolizes to me. A time where phrases like "cookie cutter" and "rat race" did not exist.